In the mid-nineteenth century, the city of Hamburg was a sovereign state within the German Confederation, a loosely organization group of thirty-nine states created at the Vienna Congress of 1815 when Europe reorganized itself after the fall of Napoleon. It was into this independent and thriving commercial port city that Felix Schlesinger was born on October 9, 1833. His older brother Karl was born five years earlier In Lausanne, Switzerland, which suggests that the Schlesinger family had only recently moved to Hamburg. When Schlesinger was eight years old, in May of 1842, Hamburg experienced a massive fire that burned for four days and left 20,000 people homeless. There is no record of how the Schlesinger family was affected by this, but at the very least, it would have been a traumatic event for all of the city’s residents. The fact that both Felix and Karl Schlesinger were sent to art school also hints at the possibility that painting was part of a family tradition, perhaps through their father or uncles. Felix Schlesinger spent only two years at the Preparatory School for Artists before leaving for the Kunstakademie Düsseldorf in 1850. There, he also studied privately with Rudolf Jordan (1810-1887). Like Heimerdinger, Jordan had studied at the Düsseldorf academy before beginning to accept private students; and his work also focused on narrative genre images, typically showing ordinary people engaged in either a moral or comic conundrum. Although it is unclear as to how long the young Schlesinger studied in Düsseldorf, he is said to have left there to study in Antwerp with Ferdinandus de Braekeler, also a genre painter as well as a humorist. By the mid-1850s, however, Schlesinger had moved to Paris where he remained for several years studying with Eugène Isabey (1803-1886) and establishing his reputation as a painter. Isabey was very much a part of the Romantic Movement of the 1820s and 1830s, and like his friend, Eugène Delacroix, he traveled to north Africa where he was fascinated by the exotic environment of Algiers. During the 1830s, however, Isabey found increasing success with historicizing genre paintings and marinescapes; it was this work that attracted Schlesinger as he began developing his own aesthetic as a genre painter. The decade of the 1850s in Paris was marked by the advent of the Second Empire under Napoleon III in 1852 and the arrival of controversial Realist paintings at the Salon. Gustave Courbet’s Salon debut with challenging—and very large—paintings such as The Stonebreakers and Burial at Ornans had provoked an explosion of commentary from both the public and the press. For a young artist like Schlesinger, this exhilarating atmosphere must have created a sense of excitement about the future, as well as highlighting the strong opposition to traditional approaches to painting. Another significant direction in 1850s Paris was the resurgence of interest in Dutch still-life and genre painting. This too was linked to the French Realist artists because of the focus on ordinary people going about their daily activities. [iii] The ferment within the Parisian arts community during this time must have provoked a variety of considerations as Schlesinger began to build his own professional career; it is clear that these years were key for his future evolution as a genre painter. Schlesinger left Paris for Frankfurt in 1861 and two years later, left Frankfurt for Munich where he finally settled, establishing himself as a successful genre painter. He exhibited regularly in Munich as well as Dresden, Vienna and Berlin, and soon became known primarily for his images of family life in the country. The documentation on Schlesinger’s personal life is sparse, but the predominance of children as his primary subject tends to suggest that he married sometime in the early 1860s, perhaps prompting his move back to German-speaking Frankfurt, and that quite a number of children soon followed. 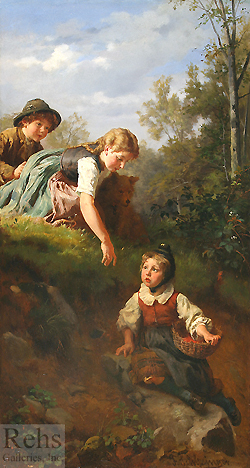 The children that appear in his paintings are consistently the same models, thus supporting the interpretation that these are mostly his own offspring. Over the years, these same models appear at various ages in the paintings. In fact, the gradual maturation of the children might offer a reasonably secure way to date these typically undated canvases. Once he was settled in Munich, Schlesinger also began to explore wider markets for his art. 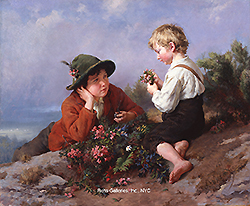 HIs gentle images of children playing as well as his domestic interior scenes were very much in vogue with art patrons throughout Europe and the United States. In part, this reflected the new understanding of childhood as a special time of life that began with the late eighteenth century writings of Jean-Jacques Rousseau, but soon became the standard in many aristocratic homes throughout central Europe. [iv] Eventually, this attitude would become institutionalized in Queen Victoria’s England as well as elsewhere in Europe and the United States. Based on the number of paintings still in private collections, and the steady sales beginning in the 1970s, Schlesinger’s work has consistently found an audience. Although a carefully documented chronology of his work has proven elusive because so few of his paintings are dated, it seems clear that he moved from early narrative works, probably based on the examples of his professors, to a more naturalistic style that grew out of his time in Paris during the seminal years of the Realist movement. As he established an independent reputation in Munich, his work became increasingly naturalistic and expressive. Schlesinger died at age seventy-seven in 1910. [i] Friedrich Heimerdinger eventually published his curriculum in his book titled Elemente des Zeichnens nach körperlichen Gegenständen für Lehrer und zum Selbstunterricht wie auch für technische Lehranstalten (Hamburg: Meißner, 1857). [ii] See Rudolf M. Misanz,The René von Schleinitz Collection of the Milwaukee Art Center (Madison, Wisconsin: University of Wisconsin Press, 1980)14-17. 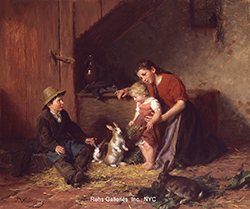 [iii] See Gabriel P. Weisberg, The Realist Tradition, French Painting and Drawing, 1830-1900, (Cleveland: The Cleveland Museum of ARt in cooperation with Indiana University Press, 1981). [iv] For a contemporary analysis of Biedermeier culture in central Europe, see Laurie Winters essay “The Rediscovery of the Biedermeier Period” in Biedermeier: The Invention of Simplicity (Ostfildern, Germany: Milwaukee Art Museum in association with Hatje Cantz Verlag, 2006) 32-41. [v] See The History of Clark County, Ohio: Containing a History of the County; Its Cities, Towns, Etc. ; General and Local Statistics; Portraits of Early Settlers and Prominent Men; History of the Northwest Territory; History of Ohio; Map of Clark County; Constitution of the United States, Miscellaneous Matters, Etc. (Chicago: W. H. Beers & Co., 1881) 490. [vi] Catalogue of Valuable Paintings Collected by the Late F.O. Matthiessen of this City, auction catalogue: April 1 and 2, 1902 (New York: American Art Association, 1902) Catalogue #36.